We close out this week at SuperPhillip Central with the fourth review of the month. 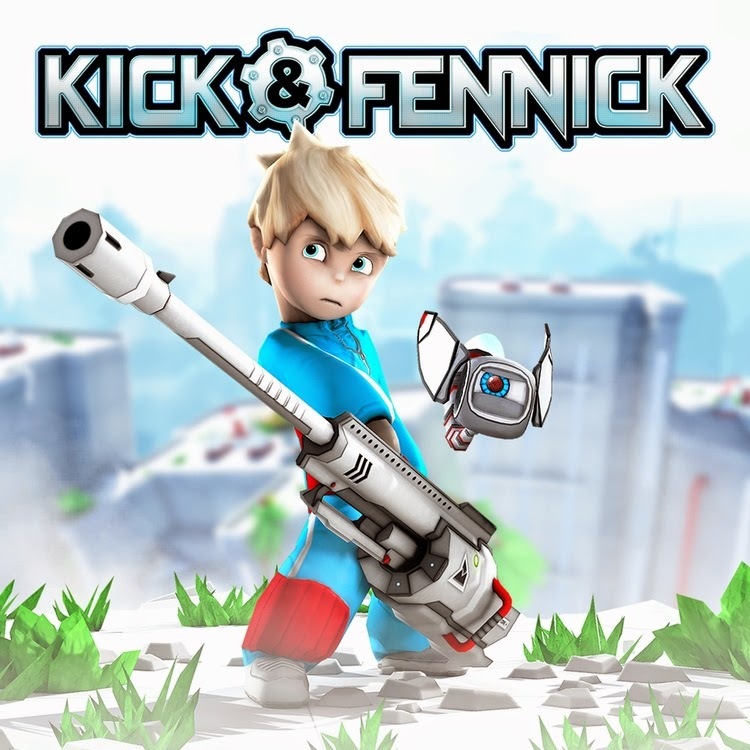 It's for a game that is free for PlayStation Plus subscribers this month, Kick & Fennick. It also just so happens to be a Vita exclusive. Here's my review. The following is no advertisement-- just some deserved praise for Sony's PlayStation Plus initiative. It has been a fantastic deal for gamers. Not only is there the ability to back up game saves to the cloud, but each month a flurry of releases are given to subscribers. The majority of these titles are ones that are of high quality, and such a game on the PS+ docket this month is an unconventional platformer called Kick & Finnick. It's such an interesting and quality release that I recommend it even if you have to pay for it for those who aren't PlayStation Plus subscribers. Read on to find out why. Kick & Fennick starts out with a boy, presumably named Kick, as there is no dialogue to speak of in the game, waking up from inside a pod of sorts. He moves through a derelict facility and ends up meeting a robot also presumably named Fennick. The two hit it off almost immediately, and Kick offers to find his new robotic buddy a new light bulb for the end of its tail. What follows is over forty unique levels spread out among five chapters. 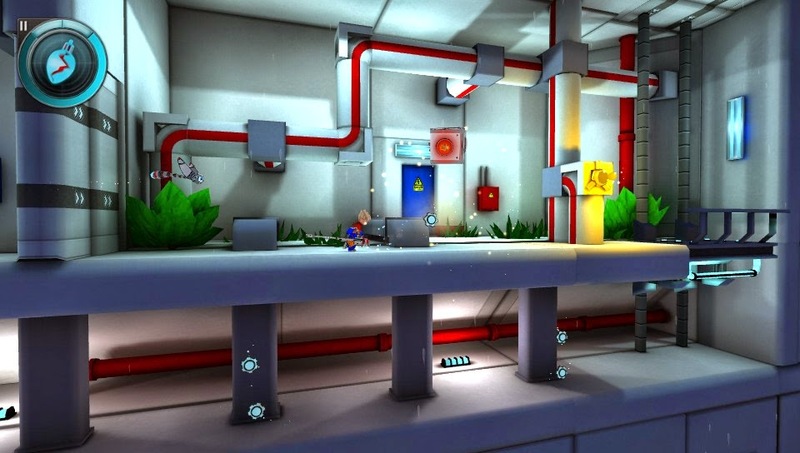 The game is an atypical platformer in that there is no jump button in Kick & Fennick. Instead, within the first level of the game, Kick acquires a special long-barreled gun that he uses to launch himself to higher and further away locations with the weapon's recoil. He can use the recoil to launch himself twice before he has to hit solid ground where the gun will recharge itself instantly. Aiming the gun is done by holding the right analog stick or using the touch screen. The former is the better and more comfortable method, I found. without the aid of Kick's special gun. When the gun is aimed, time will temporarily slow down. This is fantastic and extremely necessary for when you're flying in midair and need to make a shift in direction. 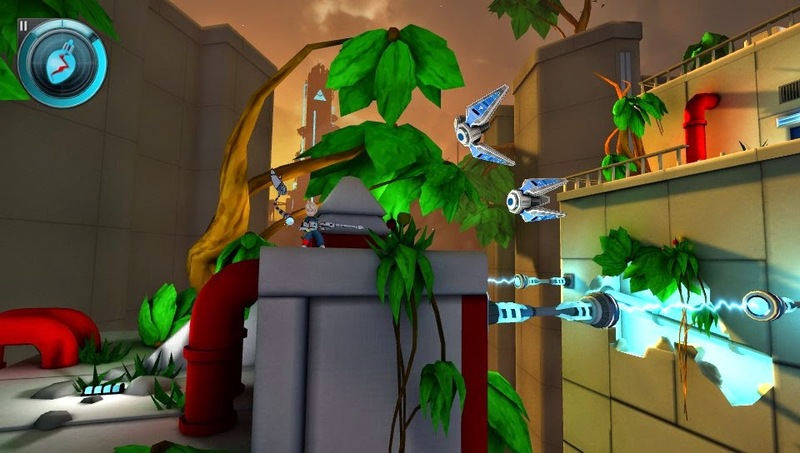 Many platforming and midair challenges require you to shoot the gun and launch Kick one way and then slow time down, aim the weapon a different angle, and launch our hero a different way. This mechanic lends itself to some very difficult trials for Kick and his gun. 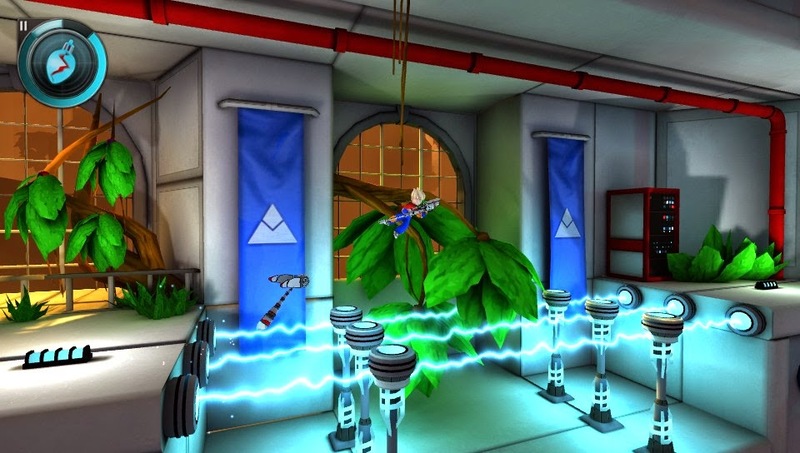 Launching himself up in the air and then using the recoil to shoot himself to the right, between two hazardous electrical currents, unscathed is but one of the many challenges Kick and players will have to confront. It only gets more crazy, more fun, and more difficult later on when momentum and the trajectories of Kick's shots are given greater importance. pits, no one said Kick's journey would be an easy one. Each time Kick falls into a bottomless pit, gets squashed between two hard surfaces, or finds himself electrified, his pal Fennick is there to bail him out, transporting him to solid ground. However, each time Fennick rescues Kick, a portion of an energy gauge goes down. If it empties completely, you have to start over from the beginning of a given level all over again. Fortunately, Kick can collect Powernodes (the game has no use for a space between "power" and "node") to refill Fennick's energy gauge, allowing you a safety net for future failed jumps and botched aims of Kick's gun. also causes the energy gauge to decrease. Each level in the game has fifty Powernodes which are spread out, sprinkled, and hidden all over for the player to collect. This is purely optional, but in doing so, not only are you extended the longevity of the game, but many Powernodes require skillful play to reach them. It makes the game even more challenging than it already is to find and secure every Powernode in each level and survive. but they definitely are handy, too. 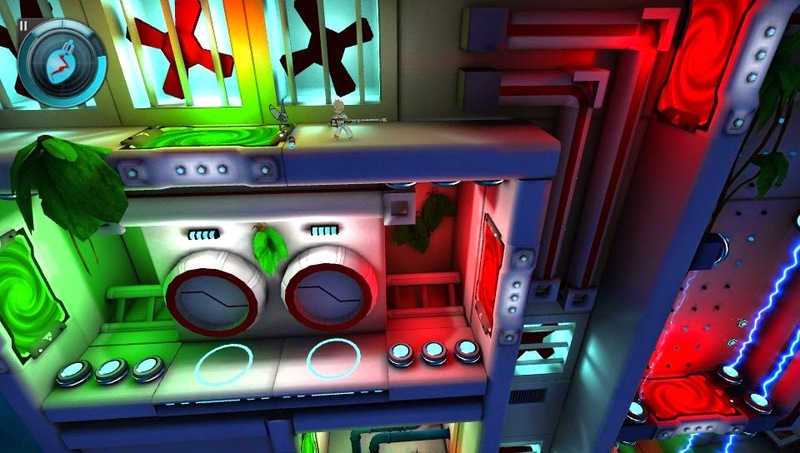 In addition to the fifty Powernodes, each level possesses a Special Gear that is usually placed in a very well hidden area. Regularly seeking out and collecting these unlocks new color schemes for Kick's outfit. Again, like the Powernodes, finding and acquiring these adds replay value, forces you to fully explore levels, and also puts you into more challenging predicaments that you otherwise might miss out on by not searching for them. ganging up on a little boy. That isn't to say that Kick & Fennick is a game that is a breeze to beat even if you don't go off the beaten path. 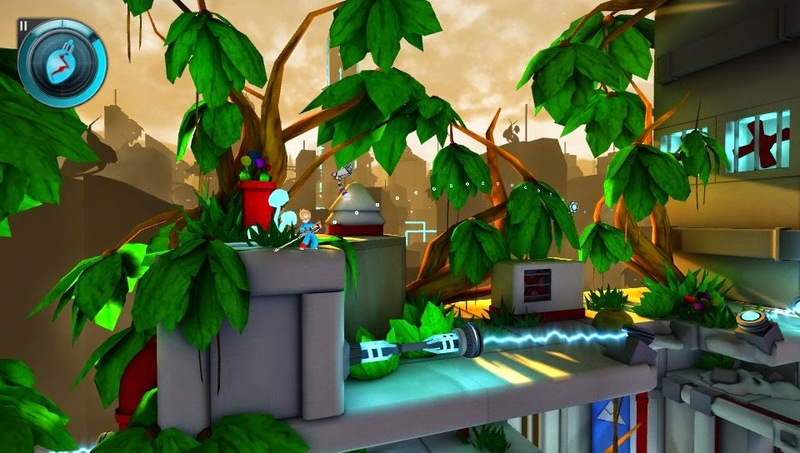 While the game generally gives a steady difficulty curve, there are some levels that feature obstacles and platforming challenges that come out of nowhere and hit the player hard. This can create some frustration, but these jumps in difficulty are few and far in between, thankfully. Kick & Fennick's presentation is quite solid. 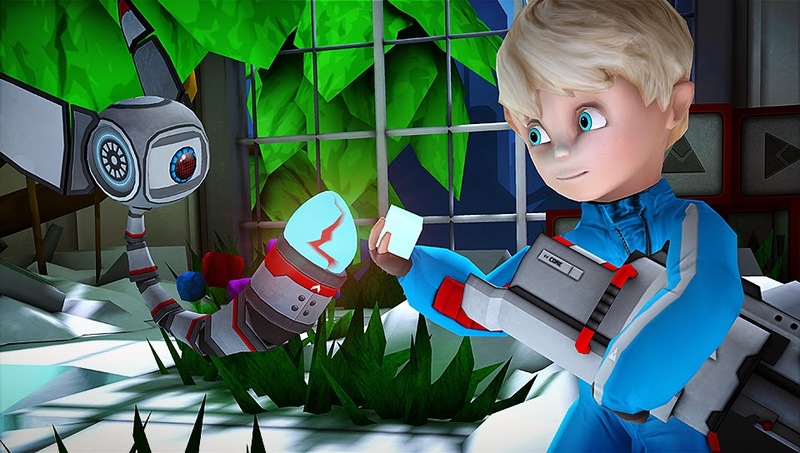 Kick is an endearing character and a lot of that comes from his appealing 3D model. Environments are highly detailed, though some more variety would have been appreciated. A lot of levels take place in and on dilapidated buildings and cityscapes with just the time of day being different. The loading times aren't too bad, but they add up when you miss out on a Powernode and wish to retry the level. Since there is no "restart level" function in the pause menu, you have to back out to the main menu, costing 20-30 seconds of your time each occurrence. In addition to that issue, I have also had Kick & Fennick freeze when loading a level, and also the game simply crashed once while playing. 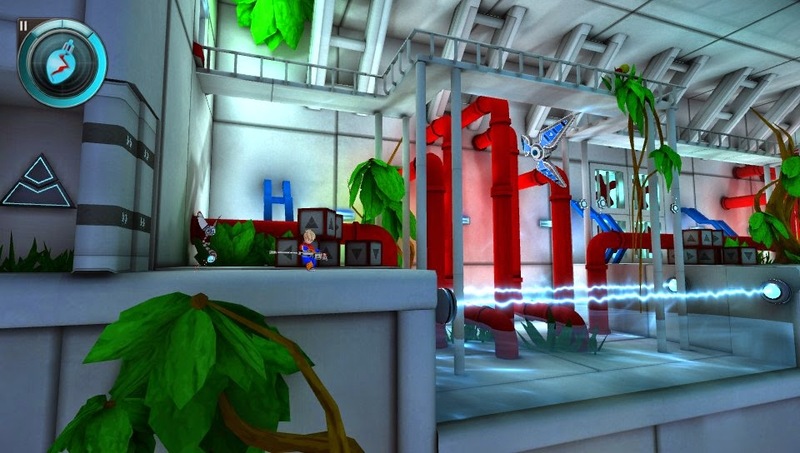 Overall, Kick & Fennick is an innovative 2D platformer with a great hook, brilliant level design, and loads of secrets. It's a nice game to just play one or two levels, or just sit down and play an entire chapter. The gun and recoil mechanic is fantastic, offering a fresh take on a tried and true genre. Some levels may become overly frustrating-- especially on the hard difficulty-- and there are some problematic jumps in difficulty here and there, but all in all, Kick & Fennick is an affordable and well-worth-it jump and run.... or is it launch and run? While I figure this question out, you go ahead and download this gem of a PlayStation Vita exclusive. Review copy provided by Jaywalkers Interactive.